Johannesburg, Aug 15 (IANS) The wife of Zimbabwes President Robert Mugabe has been accused of assaulting a woman at an upscale Johannesburg hotel and was due to appear in court in South Africa, officials said. Grace Mugabe “handed herself over to the police” but is not under arrest, South Africa’s Police Minister Fikile Mbalula was quoted as saying by BBC. South African model Gabriella Engels, 20, accused Zimbabwe’s First Lady of assaulting her Sunday night while she was visiting Mugabe’s sons in a hotel room in an upscale Johannesburg suburb. The model claimed that the First Lady’s bodyguards stood by and watched as Mugabe attacked her. She also released an image of a face injury online. In a phone interview for South Africa’s News24 news site, Engels said: “When Grace entered I had no idea who she was. She walked in with an extension cord and just started beating me with it. In a statement, the police confirmed that on Monday an unnamed 20-year-old South African woman had registered a “case of assault with intent to do grievous bodily harm”. They said the suspect could not be named as she had not yet appeared in court. 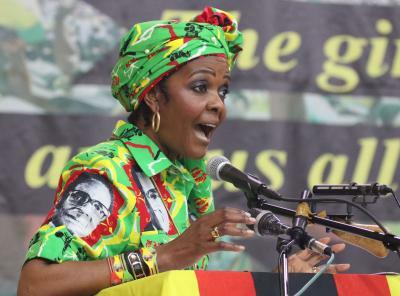 Zimbabwe’s First Lady, 52, was in South Africa to be treated for an ankle injury sustained during a road accident last month, according to the local media. It was unclear whether Mugabe would qualify for diplomatic immunity in South Africa if charges are brought against her. The police are considering the implications of the case, the report said.